Reduced training budgets need not imply reduced organizational training. In fact, in challenging times like these, skilling and re-skilling of the workforce is critical. Laytime and Demurrage are perhaps the two most litigious aspects of chartering vessels and have been the subject of numerous disputes over the years. 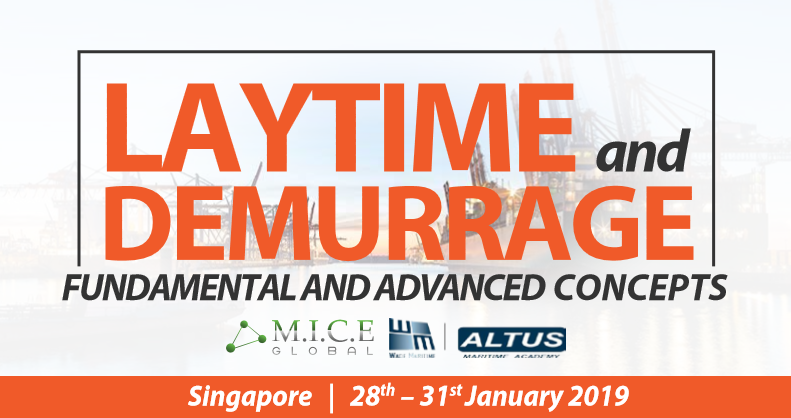 This training programme is uniquely designed to focus on the complexities of Laytime and Demurrage (both Wet & Dry sectors), gaining practical expertise and knowledge to understand and analyse contractual issues and post-fixture strategies. Delegates will have the opportunity to gain precious insight and first-hand knowledge from our panel of leading industry experts. This course will be very useful for the Supply, Trading and Risk management departments of shipowners and managers, the Commercial and Operations departments of major oil & bulk operators, Charterers, Ports & Terminal operating companies, P & I club executives, Demurrage Claims handlers and analysts, Maritime Lawyers and Arbitrators, Banks and Financial institutions involved in Shipping Finance, Commodity Traders and ship management personnel.